The next decade is critical if the world is to prevent the most catastrophic impacts of climate change; the amount of investment required lies in the trillions of dollars. The proliferation of climate funds has led to inefficiency in the channeling and delivery of finance. This report proposes solutions to enhance the impact of multilateral climate funds, based on an extensive review of the literature and interviews with more than 50 stakeholders. A set of five strategies is key to success: scaling up impact, promoting greater country ownership, improving efficiency, supporting equitable allocation, and increasing accountability of operations. To improve their effectiveness, these funds should undertake a series of operational and architectural reforms. In the near term, funds should define their mandates and specializations to ensure an improved division of labor; in the longer term, some funds may need to merge or close. The next decade will be critical if the world is to prevent the most catastrophic impacts of climate change. The 2015 Paris Agreement on climate change established an ambitious goal to limit the increase in global average temperature to well below 2 degrees Celsius (2°C) above preindustrial levels, while aiming to limit it to 1.5°C. The agreement also has a goal of increasing the ability to adapt to climate change and fostering resilience. The amount of investment needed to achieve these goals lies in the trillions of dollars. By far the largest sums of capital lie in the private sector, and aligning these investment funds with climate and sustainable development goals is key. Although it is smaller in amount, public finance also plays a critical role; it is the source over which policymakers can exert direct control, and it is essential for providing public goods and services that the private sector is unwilling or unable to support. When deployed effectively, public finance can catalyze private investment by stimulating markets, fostering innovation, and reducing risk. A rich and varied architecture of public institutions is involved with raising, channeling, and deploying finance for climate-related activities. These funds and institutions follow bilateral and multilateral channels and use a variety of instruments. Among them, multilateral climate funds play a key role in using international public finance to stimulate the shifts in investments by other public and private finance institutions that are necessary to drive a broader economic and societal transformation. Only transformation at a global scale will be sufficient to reduce emissions and improve climate resilience in order to meet international climate and sustainable development goals. Multilateral climate funds face a number of challenges to realizing their full potential. Over the last two decades, there has been a proliferation of bilateral and multilateral funds providing climate finance, each one responding to needs that emerged at different times. Among the multilateral climate funds, the result has been some overlapping of roles and duplication of effort. Policymakers are now raising questions about how to improve coherence and complementarity and respond to evolving developing country needs in order to enhance effectiveness. Additionally, the future direction and role of some multilateral funds is unclear due to resource constraints, evolving mandates, or unresolved questions pertaining to their continued existence. These issues have led to debate in contributor countries regarding where to allocate public resources, and in recipient countries regarding which funds they prioritize their engagements with. This report focuses on seven multilateral climate funds. Five are explicitly part of the institutional framework of the UN Framework Convention on Climate Change (UNFCCC): the Green Climate Fund (GCF), the Global Environment Facility (GEF), the Least Developed Countries Fund (LDCF), the Special Climate Change Fund (SCCF), and the Adaptation Fund (AF). The two Climate Investment Funds (CIFs)—the Clean Technology Fund (CTF) and the Strategic Climate Fund (SCF)—lie outside this UNFCCC framework. The SCF encompasses three further programs: the Pilot Program for Climate Resilience (PPCR), the Forest Investment Program (FIP) and the Scaling-Up Renewable Energy in Low Income Countries Program (SREP). To underpin our analysis, we identify five key strategies that multilateral climate funds should pursue if they are to be effective in supporting transformative change. These strategies embody both guiding principles for change and goals for action. Achieve impact at scale. Trillions of dollars in investment are needed to address climate change, and multilateral climate funds should play a key role in scaling up climate finance by deploying their resources catalytically to mobilize larger flows of funding that achieve systemic change. Promote country ownership. Funds should ensure that finance is being channeled to support nationally determined priorities (inclusive of broad stakeholder engagement) and strengthen national capacities to plan, coordinate, implement, and monitor climate actions. Improve efficiency. Funds should pursue greater efficiency in minimizing transaction costs, speeding up project delivery, and providing access to money. Support equitable allocation. Funding should be fairly allocated to reach developing countries with the greatest need, for the range of climate actions that will be necessary. Increase accountability. Funds should improve processes to ensure that activities fulfill their mandates and comply with operational policies (including fiduciary standards, safeguards, and grievance processes). Our analysis shows that the existing climate finance architecture needs to be improved to deliver on all aspects of these strategies. Challenges include structural, resource, and operational issues. However, the current architecture is not set in stone. The direction of climate funds will be raised in several policy arenas over the next few years, including discussions on fund replenishments and complementarity/coherence among funds. Policymakers have an opportunity to make changes to the funds to ensure that their impact is positive and responsive to the evolving needs of developing countries. We propose that the multilateral climate funds undertake a set of reforms to improve their effectiveness in catalyzing the transformation to a low-emissions, climate-resilient world. Even without changes to their formal operations, funds could improve their coordination to ensure that they meet countries’ diverse needs, minimize duplications and inefficiencies in their portfolios, and simplify access to funding. This would require funds to think strategically and collaboratively about who is best placed to serve different thematic and geographic areas, who should support which activities, and how needs will evolve over time. Funds could improve coordination by having their secretariats and boards engage with each other more closely. At the country level, programming and planning need to be holistic and not limited to a fund-specific portfolio. One possible solution is for countries to identify one ministry or body that serves as the national focal point or authority for all the climate funds. There is also a need for more coordinated readiness support and capacity building than is being provided by the funds and their readiness partners. There may be value in establishing a broader readiness hub or program that addresses overall planning and pipeline needs. The funds currently use a multiplicity of rules and procedures to access finance. This results in considerable inefficiencies for implementing entities, particularly national entities with less capacity. Recipient countries must design systems that respond to different demands and different standards. The complex system also makes it harder for stakeholders to track impact and hold funds accountable. Funds could agree on a consistent set of fiduciary standards, environmental and social safeguards, and gender policies that apply across all funds. Standardizing accreditation and funding proposal procedures would also be a significant improvement. 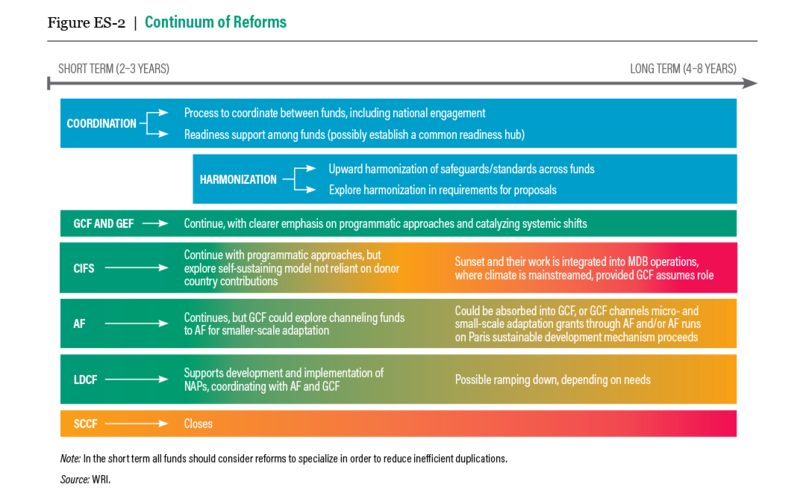 In addition to increased efficiency, funds would also see greater complementarity in readiness efforts if rules were harmonized—all readiness and capacity-building programs would support entities’ ability to access any of the funds. Transparency might also improve with such changes. Transformation will not occur if the bulk of financing goes to one-off projects that do not catalyze more systemic change at national, regional, and, ideally, global levels. Funds should support systemic shifts by strategically investing in policy initiatives or actions that have the potential to change behavior in markets and economies beyond the confines of a specific activity. Programmatic approaches, which typically involve bundling or aggregating activities that contribute holistically to a particular outcome, are a useful approach for supporting necessary policy and market shifts. Such programmatic approaches can increase efficiencies and promote country ownership by enabling entities to program larger sums under one proposal, then devolve decision-making to national or regional levels. The GCF and CIFs have a niche in supporting programmatic approaches, and the GEF could play a complementary role through cross-sectoral programming and smaller catalytic interventions. Some duplication is beneficial because it provides choice, but it is not efficient for all funds to attempt to fulfill the broad spectrum of needs. A clearer division of labor would help both contributors and recipients to prioritize their engagement. Funds could build on their existing comparative advantages and specialize in different areas, with a view to reducing inefficient duplications and addressing gaps in current provision. The GEF could support impact at scale by focusing on its traditional strengths in working across the five conventions it serves (Climate Change, Biological Diversity, Persistent Organic Pollutants, Desertification, and Mercury), and focusing “pure play” climate change support on catalytic mitigation interventions. In doing so, the GEF can complement the GCF and CTF in supporting programmatic approaches and systemic shifts for mitigation. GEF support for capacity building, a core mandate, also strengthens country ownership; its Capacity Building Initiative for Transparency will need to be incorporated as a strong feature in the next GEF replenishment. The GEF Council would need to ensure the fund exercises discipline in retaining a sharp focus on these core strengths, rather than trying to expand its work outside its area of comparative advantage. The LDCF could support equitable allocation by positioning itself to be complementary to the AF in the small-scale adaptation space, focusing particularly on projects larger than $10 million or on least developed countries (LDCs) that do not gain direct access to the AF. The LDCF currently plays an important role in providing more options for LDCs to access adaptation funding. To date, the LDCF has supported development and implementation of national adaptation programmes of action (NAPAs), which are short-term plans, in nearly all LDCs. It is now supporting the development and implementation of national adaptation plans (NAPs), which are long-term plans to build resilience and critical for capacity building. The emphasis on national planning also supports country ownership. The SCCF could support equitable thematic allocation by focusing solely on its technology window and cede its work on adaptation to the AF and GCF. The SCCF’s technology transfer window has to date received less attention and financing; however, it is the only fund with an explicit thematic window for technology transfer. While the SCCF’s adaptation window is currently larger, there are now four other funds that support adaptation, with several billion dollars in combined resources. This suggests the SCCF’s thematic niche, if adequately resourced, could be in technology. The AF could continue to support equitable allocation and country ownership by focusing on small-scale adaptation activities and increasing countries’ direct access to funding. While programmatic approaches can be important for adaptation, there is still a need for smaller, concrete actions across a wide range of countries. Furthermore, the AF plays an important role in building the capacities and track record of national institutions to undertake adaptation work, and can be a stepping-stone for many national institutions to access the GCF. The CIFs could continue to focus on their comparative advantage: working through multilateral development banks (MDBs) with a relatively small number of countries to develop programs that use concessional resources to catalyze larger levels of private investment for impact at scale. The CTF should continue supporting programmatic, large-scale clean energy projects, and the SCF’s programs could focus on supporting the sectors in countries that may not receive priority from other funds. Focusing on a smaller number of countries allows the CIFs to allocate more resources for higher impact. The CIFs could also place more emphasis on using their knowledge of low-emissions and climate-resilient projects to help MDBs move away from financing high-emission and maladaptive investments. The GCF could focus on impact at scale by providing larger-scale, programmatic interventions and developing the institutional and policy frameworks necessary for longer-term mobilization of investments. To continue enhancing country ownership, the GCF should strengthen its readiness program and fund smaller interventions for national entities that need to build their capacities to handle larger amounts of funding. The fund could explore programmatic approaches for adaptation but leave adaptation projects of less than $10 million to the AF and coordinate with the LDCF to enhance efficiency in NAP funding and related implementation. The fund could also develop targeted criteria for allocations in its mitigation window, potentially carving out funding to focus on countries with large mitigation potential but significant barriers to financing that cannot be addressed through other funding sources. In the longer term, clarifying the division of labor may not be sufficient to address inefficiencies and the overlaps between funds. Resources are limited and developing countries report many difficulties in navigating the complex and crowded funding landscape. Closing or consolidating funds may therefore be warranted. In doing so, it is important to ensure that key roles played by funds are not lost in the transition. Stakeholders largely agreed that the two operating entities of the UNFCCC financial mechanism (the GEF and GCF), which also serve the Paris Agreement, should continue. There was less agreement with regard to the future of the CIFs, the LDCF, the SCCF, and the AF. The LDCF, SCCF, and AF are also linked to the Paris Agreement; however, the Conference of Parties and Conference of the Parties Serving as the Meeting of the Parties to the Paris Agreement could revisit their mandates and relationships as discussions evolve over time. Several stakeholders felt that the CIFs should begin the process of sunsetting, assuming the GCF scales up and is able to fill key roles played by these funds. If the GCF successfully scales up delivery of resources, over time it could potentially absorb some of the CIFs portfolio of work. Being the only other fund that can work at the same scale, through the same instruments, in the same breadth of thematic areas, and with a strong programmatic focus, the GCF could fill the roles currently played by the CIFs while working through a wider range of entities, including national institutions. It will be especially critical that the GCF take up the programmatic approach that the CIFs have played an important role in developing. Sunsetting would directly address the concern that the CIFs operate outside the guidance of the international community’s UNFCCC process. If the CIFs do not sunset, they should explore ways to continue with less funding coming from country contributors, so as not to draw resources away from other funds. The SCCF and, to a lesser extent, the LDCF, have struggled to attract funding to support their intended operations and may need to close or be consolidated. If there are no additional pledges, one option would be for both of these funds to be absorbed by the GEF so that relevant activities can continue through core GEF support. Another option is to close the SCCF (since the GCF, CIFs, and GEF can support similar activities) but maintain the current operations of the LDCF, assuming adequate resourcing. While the GCF does emphasize adaptation support for small island developing states (SIDS), LDCs, and African countries, it is not targeted as closely as the LDCF is for LDCs. If no formal decision is taken to sunset the SCCF, it is likely to become functionally dormant, due to lack of contributions. In principle, it would be possible for the GCF to absorb functions performed by the AF, but a dedicated fund for adaptation could still provide added value. The GCF has a strong focus on adaptation, can support small-scale projects, has accredited many of the AF implementing entities, and includes adaptation in readiness support. However, many stakeholders noted that with its experience in small-scale adaptation and direct access, the AF could still play a distinct role in the architecture. If so, there should be a division of labor between the funds for adaptation, where the AF builds on its niche, while the GCF focuses on larger, more transformative, or financially innovative approaches. If the AF continues, one option would be to develop formal institutional linkages between the GCF and the AF. The GCF could channel funds to the AF as programmatic envelopes to seed small-scale activities that could be taken back to the GCF for further funding and scaling up at a later stage. This would address resourcing constraints for the AF and would likely require lifting its current country cap so that countries with greater need could receive more than $10 million. Another possible solution to the AF’s resource challenge would be to decide that a share of proceeds from the mitigation and sustainable development mechanism, established under the Paris Agreement, should be channeled through the AF. Overall, closing and consolidation could bring gains in efficiency but also reduce choice. Consolidation would have implications for the remaining funds (particularly the GCF and GEF). The GCF is now operational and holds much promise, but it still faces challenges in disbursing allocated funds and attracting a strong project pipeline. The GCF’s readiness program is running, but it needs more capacity to meet developing country needs. GCF staffing also needs to strengthened. Thus, at the moment, while the GCF has the potential to absorb the roles of most other funds, it is not yet fully in a position to do so. This may change in time. If the LDCF and SCCF are absorbed into the GEF, this will require expanding the GEF’s current mandate to include adaptation focused on LDCs. Further, if the CIFs sunset, considerable pressure would be put on the GCF and the GEF’s climate change funding to deliver impacts at scale. We suggest a set of reforms, with changes in the shorter term (2–3 years) focused on improving the coordination and specialization of current funds while, in the longer term (4–8 years), funds are closed or consolidated. The recommendations we propose are not necessarily mutually exclusive, nor are they the only options worth considering. Policymakers and other decision makers must think strategically and carefully about how the architecture of climate finance should evolve. Governments will need to consider different options, in collaboration with other stakeholders, including civil society, private sector actors, and implementing entities. Decisions over the next decade must drive the systemic shifts necessary to respond to the urgency of the climate challenge. Over the past 25 years, dozens of national, regional and international climate funds have emerged, creating a confusing system. New WRI research offers recommendations to more effectively attract and disburse climate finance.